Radiant heating systems are a clean, effective, and efficient alternative to forced-air systems. They warm you with cozy radiant heat underfoot. Radiant floor heating system uses a nubby plastic base to hold heating tubes or cables in place while lightweight concrete is poured to encase them. Radiant floor heating systems are either hydronic (using hot water) or electric. Here is how each one works. With a hydronic floor heating system, hot water circulates through lengths of tubing that loop back and forth on the subfloor. The tubing is usually encased in a slab of concrete or lighter-weight gypsum cement. In some cases, the tubing can be fastened to the underside of subflooring instead. 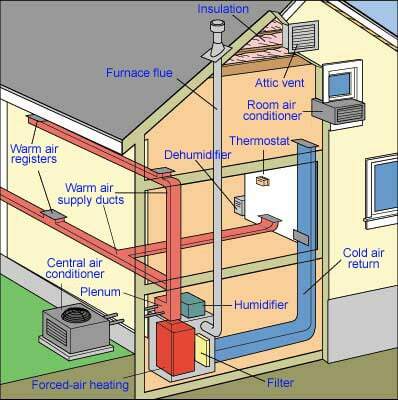 A clear advantage of hydronic systems over other forms of heating is that you can use a variety of energy sources to heat the water: a gas water heater, electric boiler, wood boiler, heat pump, solar collector, or even geothermal energy. 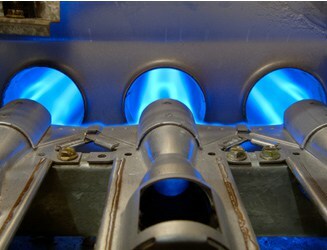 If, in a few years, your heating source, such as oil for a boiler, becomes too expensive, you can change over to solar or some other source. Hydronic tubing is strapped to solid foam insulation on a concrete slab before lightweight concrete is poured. Note that this significantly raises the floor level. Another advantage is that the water retains residual heat longer than electric wires. The heated water warms floors to about 85 degrees F. (or cooler—it generally feels similar to a tile floor warmed by direct sunlight). A zone control adjusts floors of various rooms to the desired temperatures. 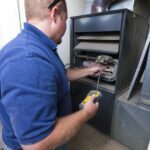 Hydronic heating’s reputation was tarnished in the 1940s and ’50s when temperature control was marginal and metal piping corroded, leaving leaky pipes that were difficult, if not impossible, to repair. But manufacturers of today’s water-circulating systems have learned from those mistakes and taken advantage of modern technology and materials to produce high-quality, low-maintenance systems. These utilize sophisticated control manifolds and polybutylene or synthetic rubber tubing that has proven its durability under extreme test conditions. Electric-resistance radiant floor heating works like a toaster. When electric current travels through electric wiring, it generates heat. 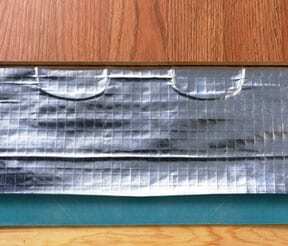 This infrared-carbon electric heating foil is designed to go directly beneath surface flooring that doesn’t require nailing—in this case, a laminate floating floor. 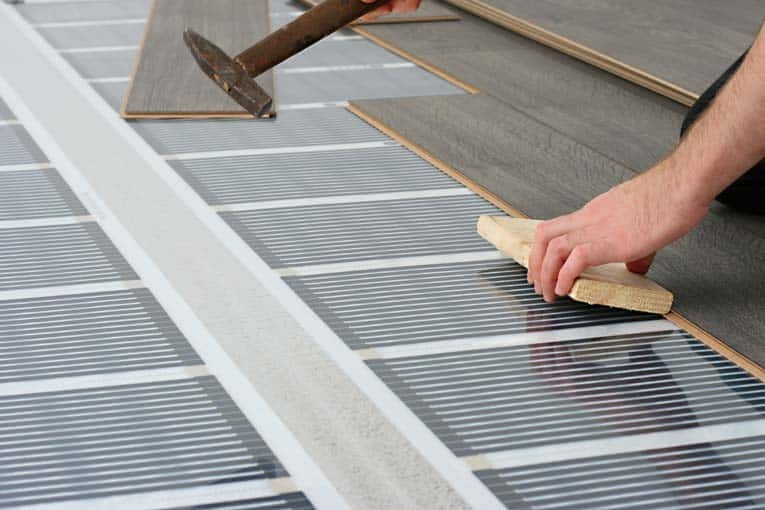 With this type of heating system, special floor-heating cables or woven mats, foils, or panels with built-in wires are installed on, in, or under the subfloor. Then they’re hooked up to an electrical circuit and a control such as a thermostat. When the control is turned on, electric current that moves through the cables or wires heats the floor. Electric cables can be routed through a slab, similar to hydronic systems. With cable systems, a fairly large electric heating cable is wound back and forth on the subfloor. 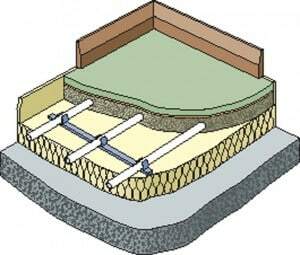 Concrete or gypsum cement is poured over it, resulting in a slab with the cables inside. This base, perfect for finish flooring such as tile or stone, is flat, solid, and full of thermal mass for retaining and slowly releasing heat. If your utility company offers lower rates during off-peak hours, you can save money by heating such a floor during those hours; the floor will retain the heat and then release it slowly during peak hours. Because of the high cost of electricity in most regions, electric radiant floor heating is generally reserved for bathrooms, kitchens, or small room additions that are expensive or difficult to heat by extending the existing heating system. Radiant floor heating is at its absolute best in bathrooms with stone or tile floors that would otherwise be cold underfoot. Manufacturers suggest that a 120-square-foot room may cost only about 40 cents a day to heat, but the actual cost in your home will depend entirely on the cost of your electrical power. Electric heating foil installs beneath flooring. Most mats, foils, and panels are fastened between floor joists, laid between joists on top of fiberglass insulation, or embedded in the subfloor. 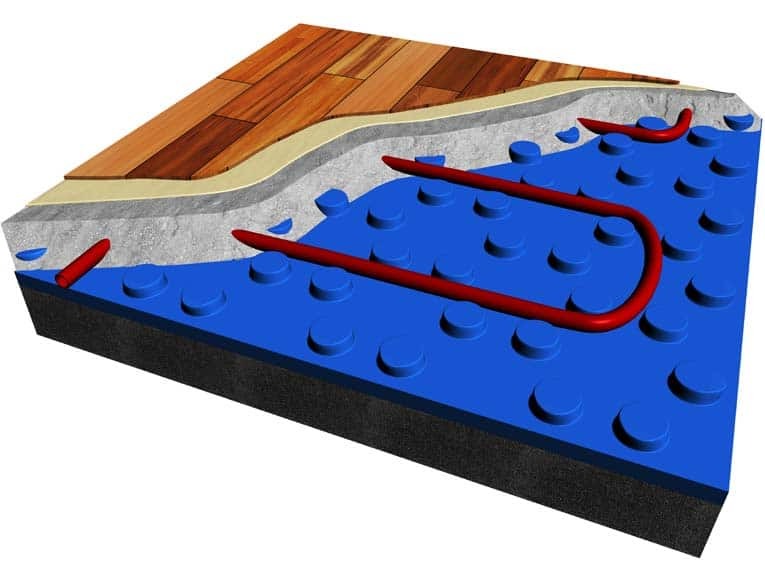 A relatively new foil product, the Environ II System made by WarmlyYours, has a UL rating that allows safe installation directly beneath a carpet or laminate floor on the underlayment pad. In the universe of radiant floor heating, this is very easy and inexpensive to install and, because it is placed so close to the floor’s surface, it is very responsive and effective at heating.